John was born in Boston on August 5, 1727, to Thomas and Elizabeth Baxter Rodgers. Within a few months, the family including two sons and six daughters moved to Philadelphia. When he was about twelve years of age, John had several opportunities to hear George Whitfield preach and it was during this time that he professed his faith in Christ and shortly thereafter devoted himself to the ministry. He began his studies including the biblical languages with Mr. Stevenson who was from Ireland and operated a grammar school in Philadelphia. Staying there for only a few months, he changed to the grammar school in Neshaminy taught by a Presbyterian minister named Roan. Rodgers left Neshaminy in the summer of 1743 to continue his studies with Rev. Samuel Blair in Chester County, Pennsylvania. Rodgers did not receive a formal college education, but Samuel Miller says of him that “he certainly received an education incomparably better than what usually passes under that title” (20). Young Rodgers went on to study theology with Gilbert Tennent, who was at the time pastor of Second Presbyterian Church, Philadelphia. After supplying several churches in New Castle Presbytery for a short time, Rodgers went with his friend, Samuel Davies, to Virginia. Davies was moving to Virginia to accept a four-congregation call in Henrico County. However, there was considerable trouble with the duo’s entrance into the Church of England stronghold of the Virginia Colony, even though the governor was sympathetic to their request to minister, there were others in government that were not. After some discussion with the authorities and administrative buck passing, Davies was allowed to minister as a Presbyterian in the colony, but Rodgers had to leave. Having one door closed, he sought another one that he hoped might open for him in Somerset County, Maryland. 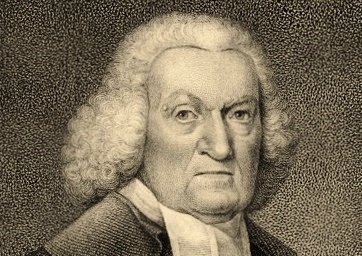 He spent about four months of 1748 preaching in Maryland. In the fall of 1748, John Rodgers left Maryland to return to Pennsylvania for a time. While there, he was confronted with four possible calls and selected from them an opportunity at St. George’s in New Castle County, Delaware. He was ordained and installed in the church by the Presbytery of New Castle, March 16, 1749. His mentor, Samuel Blair, presided in the laying on of hands by presbytery, with the sermon delivered by Rev. Samuel Finley. It was during Rev. Rodgers’s service to the St. George’s congregation that he married Elizabeth Bayard in a service conducted by his friend, Samuel Finley. Elizabeth and John had four children; two sons and two daughters. Of these children one son and one daughter died in infancy. Mrs. Rodgers died just over ten years after they were married. Rev. Rodgers was remarried in First Presbyterian Church, Philadelphia, on August 15, 1764, to Mary Grant, who was the widow of a merchant named William Grant. The next year Rodgers was offered a call to the Wall Street Church in New York City, which is currently First Presbyterian Church at a different location. While the call to New York was pending, Rodgers was offered a call to an “important congregational church in Charleston, in South Carolina” (121). Rodgers was unable to make up his mind between staying at St. George’s, going to New York, or moving to Charleston, thus he brought the matter before his synod which decided that the most beneficial opportunity was in New York. The call to St. George was dissolved on May 18, 1765. Rev. 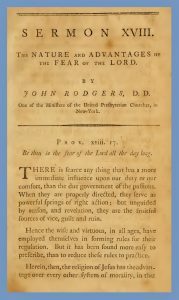 Rodgers arrived in the city with his family, was received by the Presbytery of New York on August 20, 1765, and then was installed on September 4th in the Wall Street Church. One of the challenges he faced in his new charge was a split over whether Rouse’s version of the Psalms should be used for singing or the more recent edition by Isaac Watts. In addition to reconciling the Psalm conflict, he soon noticed that the poor children in the congregation were growing up without a suitable education. He investigated the situation with the church officers and discovered that a man, Captain Owens, had left a bequest to assist the poor with their lack of funding for educating their children. However, the money was still in an account and none had been put to use. Pastor Rodgers worked through the problems and began to use the money for its intended purpose. 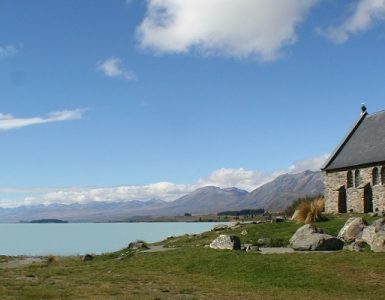 As John Rodgers’s ministry progressed and people were added to the congregation, it became clear early in 1766 that another church building was needed. It was built at the corner of Beekman and Nassau streets on land leased from the city and came to be known as Brick Presbyterian Church. Brick Church was not a separate congregation, but was instead a second location for what was called a collegiate church. That is, a single congregation was distributed, in this case, in two churches at their own locations and the pastor served both locations with colleagues as needed. The Reformed Dutch Church had used this method of ministry effectively, so the Presbyterians thought it would work for their shepherding also. Brick Church was completed in about fifteen months and opened on January 1, 1768. Pastor Rodgers preached his first sermon in the new facility from Haggai 2:7. With the battles of Lexington and Concord having been fought in April 1775, and the importance of New York City to the British recognized by its residents, many were seeking places to live outside the city believing an attack was likely. Rodgers moved his family to just outside the city for safety. As war preparations and actions progressed, the British amassed a massive army and fleet of ships for battle; it was clear that New York was in danger and there was also concern for the immediate surrounding area. Believing he needed to relocate further away from the city, Rodgers moved in May 1776 to Greenfield, Connecticut, for “a place of more comfortable retirement and greater safety” (209). The chaos and uncertainties of the Revolution resulted in Dr. Rodgers serving his ministry through several venues. Early in the war, he became Chaplain Rodgers for General Heath’s brigade. He resigned the chaplaincy in November 1776 after just a few months of service and went to Savannah. At the time, Rev. John Joachim Zubly was the pastor of the city’s Independent Presbyterian Church. During a visit by Zubly to New Jersey the previous year, he had lodged with the Rodgers family, so the Savannah visit included visiting Zubly. When Rodgers returned to New York from Georgia he again moved his family, this time to Sharon, Connecticut, where they spent the winter of 1777-78 while General Washington and his troops were at Valley Forge. The Rodgers’s next move was to Danbury where he served briefly in a church. He then accepted a call from the church in Laminton in Hunterdon County, New Jersey, where he was installed in May 1780 and served there until the end of the war. After the American Revolution officially ended with the Treaty of Paris in September 1783, the British troops evacuated New York on November 25th. When the Rodgers family returned to New York they found the city in sad shape with considerable damage. Both the Wall Street and Brick churches were in complete ruin, the parsonage was burned down, and there was a great debt due the congregation’s landlord, the City of New York, that had accrued during the the conflict. While their church properties were being reconstructed, the congregation was allowed to use the former Church of England buildings of St. George’s and St. Paul’s on alternate Sundays for worship. This arrangement was followed from November 1783 until June 1784. The Brick Church on Beekman Street was damaged less than the Wall Street Church, so it was repaired first and reopened on June 27, 1784. The churches appealed to the city to have their delinquent rents for the war years cancelled and requested a reduction in their rent from that point forward, both of which were granted. The Wall Street Church began its repairs in the fall of 1784 and completed them in June 1785. As the ministry returned to normal operation, James Wilson was called to assist Rodgers with his pastoring as the city and its churches continued to recover from British occupation and the destruction of war. 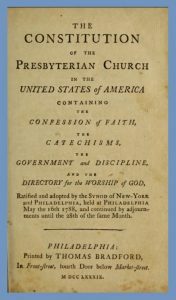 On May 23, 1785, the Synod of New York and Philadelphia appointed a committee to compose a Presbyterian Church constitution patterned after the one used in Scotland. The committee included—John Rodgers, John Witherspoon, Robert Smith, Patrick Allison, Samuel Stanhope Smith, John Woodhull, Robert Cooper, James Latta, George Duffield, and Matthew Wilson. The synod meeting of 1786 appointed an additional committee to establish a general assembly and its constituent synods. The members of the new committee were mostly from the committee that had been working on the constitution. By 1788, the constitution was completed, adopted, and copies were ordered to be printed for distribution. 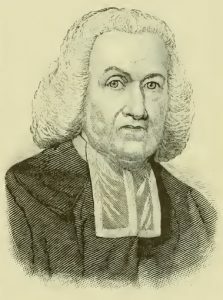 In 1789, the First General Assembly of the Presbyterian Church in the United States of America was held in Philadelphia with its moderator none other than Rev. John Rodgers, D.D. As the collegiate congregation distributed among the two churches grew, ministers Rodgers and his colleague, John McKnight, who had been called to help Rodgers, found themselves unable to attend to all the needs of the members. The problem was exacerbated by the fact that McKnight’s health was in decline. Thus, Samuel Miller was called, November 20, 1792, to become the third minister on the staff. The increasing congregation and the need for a church in the north-east part of the city led to the construction of a church on Rutgers Street that is currently at a different location with the name Rutgers Presbyterian Church. It was dedicated on May 13, 1798, and Dr. Rodgers delivered the sermon using, as he had previously done for the Brick Church dedication, Haggai 2:7 for his text. With the continued growth of New York and extension of the ministry of the Presbyterians, a fourth church was built during Rodgers ministry. It opened in the spring of 1807 on Cedar Street between Nassau and William Streets, but it is currently the Fifth Avenue Presbyterian Church at a different location. The first pastor, John B. Romeyn, was unanimously elected, left his call in Albany, and was installed the minister on November 9, 1808. The collegiate ministry of the congregation distributed in the Wall Street, Brick, and Rutgers Street churches ended in 1809 when each became a separate congregation. Thus, during Dr. Rodgers’s ministry, he had seen the establishment of three new churches in addition to his original call to Wall Street Church. In May 1810, Gardiner Spring was called and then ordained and installed on August 8, 1810, to assist Rodgers. As Rodgers weakened with age, the session allowed him to limit his preaching to once on the Lord’s Day. His decline began with a loss of memory which led to his using sermon notes after years of preaching with none. His colleague in ministry, Samuel Miller, commented that “the failure of his memory, especially at some times, was so great, that he was unable to go through the service without giving more or less pain, both to himself and his hearers” (280). He delivered his last exposition in September 1809. Early in January 1811, the aging pastor retired to his chamber where he continued to weaken. 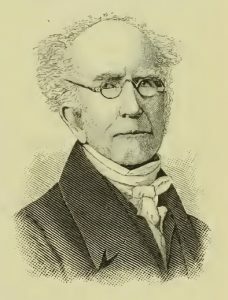 Samuel Miller was present when Dr. Rodgers passed away in the afternoon of May 7, 1811, after sixty-three years of ministry. His funeral was held in the Brick Church on Thursday, May 9, with Rev. Philip Milledoler delivering the sermon. Rev. John Rodgers, D.D., was survived by his wife, Mary, one daughter, Mrs. Susannah Tennent, who was the widow of the recently deceased Rev. William M. Tennent, D.D, and one son, Dr. John R. B. Rodgers, who was a physician that had studied medicine with Benjamin Rush. Dr. Rodgers enjoyed many honors and opportunities during his long life. As has been mentioned, he was moderator of the first General Assembly of the PCUSA in 1789. In April 1765, he was elected a trustee of what is currently Princeton University and continued in the office until he resigned in 1807. Princeton had honored him with a Doctor of Divinity in 1760. The story behind his Doctor of Divinity from the University of Edinburgh is interesting. 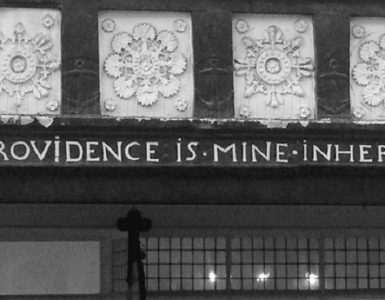 George Whitefield was visiting in London and wanted to honor Rodgers. Whitefield communicated his desire to another friend who was visiting London, Benjamin Franklin. Franklin agreed with Whitefield and wrote Dr. Robertson, who was the principal of the University of Edinburgh, requesting him to have the university give Rodgers the honorary degree. Robertson agreed with Whitefield and Franklin. The degree was conferred and in a few weeks Franklin received the official notification of the honor, which he sent to Whitefield, who then sent it to John Rodgers. The degree bore the date, Dec. 20, 1768, and Rodgers received it in April 1769. Dr. Rodgers was not a writer. His work with his collegiate congregation, his years as a Princeton University trustee, and his foundational work as a churchman for his denomination were his interests and ministry. However, a few of his multitude of sermons were published. Holiness the Nature and Design of the Gospel of Christ, A Sermon Preached at Stockbridge, June 24, 1770. The Divine Goodness Displayed in the American Revolution: A Sermon Preached in New York, December 11, 1783; Appointed by Congress, as a Day of Public Thanksgiving throughout the United States. 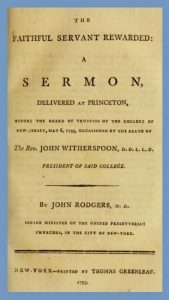 The Faithful Servant Rewarded: A Sermon, Delivered at Princeton, before the Trustees of the College of New Jersey, May 6th, 1795, Occasioned by the Death of Reverend John Witherspoon. A Charge Delivered to the Reverend Joseph Bullen, At His Designation to the Office of Missionary to the Chickasaw Indians. The Presence of Christ the Glory of a Church: A Sermon Delivered November 6th, 1808, at the Opening of the Presbyterian Church in Cedar Street, New York. He also published four sermons in the 4 volume set titled, The American Preacher, which was published in Elizabeth Town, New Jersey, 1791-1793. In vol. 1 is found, “The Nature and Advantage of the Fear of the Lord,” Proverbs 23:17, 339-354; in vol. 2 is the sermon, “A Caution against Declension in the Ways of Practical Piety,” Galatians 6:9, 267-283; and in vol. 3 are, “The Value of the Soul,” and “The Danger of Losing the Soul,” both from Matthew 16:26, 335-353, 355-371. 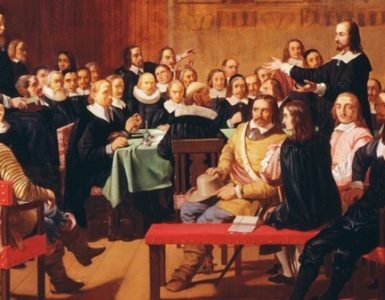 Notes—it was mentioned in the biography that the Reformed Dutch Church made use of the collegiate system for its congregations. See the Presbyterians of the Past biography for John Henry Livingston by clicking HERE. In terms of his importance to his denomination, Livingston was to the Reformed Dutch as John Witherspoon was to the Presbyterians. The picture of the elderly man with the glasses and bald crown is Samuel Miller in his later years; a picture of him at a younger age was not available. Sources—the great majority of the material in this biography was found in Samuel Miller’s book, Memoirs of the Rev. John Rodgers, D.D., Late Pastor of the Wall Street and Brick Churches, in the City of New York, New York: Whiting and Watson, Theological and Classical Booksellers, 1813, the page numbers referenced in the Presbyterians of the Past biography of Rodgers refer to this book; some of the information about Rodgers and Zubly was found in The Journal of the Reverend John Joachim Zubly, A.M., D.D., March 5, 1770 through June 22, 1781, Georgia Historical Society Collections, Vol. XXI, ed. Lilla M. Hawes, Savannah: The Georgia Historical Society, 1989; a helpful book is, The Presbyterian Church in New York City, by Theodore Fiske Savage, The Presbytery of New York, 1949, there is an index of the ministers that have served in the presbytery with their churches and service dates. Another helpful book that provides a view of the synod is Robert Hastings Nichols’s, Presbyterianism in New York State: A History of the Synod and its Predecessors, Philadelphia: Published for the Presbyterian Historical Society by The Westminster Press, 1963. The black and white portrait of Rodgers at the beginning of the biography is from the frontispiece of Samuel Miller’s memorial.